Based on the much loved 1954 film of the same name, White Christmas is a beautiful musical about the true spirit of Christmas that the whole family can enjoy. 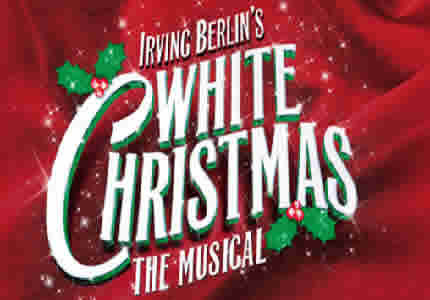 Adapted for the stage by David Ives and Paul Blake, White Christmas was a big hit on Broadway in 2008. Like the film starring Bing Crosby, White Christmas follows the tale of two friends in the army during Word War II, Bob and Phil. As the war ends, Phil convinces Bob, a former Broadway star, to team up as a performing duo; a pact which they fulfill with much success in the coming years. As the pair enjoy their triumph in the performing world, Phil becomes concerned that Bob has not yet fallen in love and settled down with a woman. However his concerns are quelled as the duo team up with a beautiful pair of siblings, Betty and Judy, who auditioned for their act after seeming encouragement from the men’s former sergeant. Just the lads start to fall for their female counterparts; trouble presents itself when the girls have to flee their crazed landlord who is trying to get the pair arrested. Fleeing to their ex-sergeant brother’s ski lodge, Bob and Phil quickly join the girls. However things get even worse as they realise their old friend’s lodge is in financial trouble. Surely only the magic of a musical will save him?! Framed by events that take place on Christmas Eves, several years apart, White Christmas is certainly a festive furore filled with the spirit of the season. Starring actor, singer and presenter, Aled Jones as Bob Wallace and actor turned dancer, Tom Chambers, as Phil Davies, White Christmas is jam packed with songs, dance numbers and romance! Other cast members include Wendi Peters as Martha, Graham Cole as General Waverley, Rachel Stanley as Betty Haynes and Louise Bowden as Judy Haynes, with Lori Haley Fox, Michelle Bishop, Phil Cole, Brendan Cull and Jonathan Halliwell. Also in the cast are Vikki-Marie Ryan, Lucinda Lawrence, Karen Aspinall, Emma Caffrey, Hayley Reed, Helen Patching, Vicki Davids, Jennifer Davison, Grace Holdstock, Ross McLaren, Joshua Lay, Matt Cheney, Jonny Labey, Anthony Whiteman, Eddie Myles, Stuart Winter, Matt Clark and Gary Murphy. Amy Snudden, Emily Robins, Sophia Pettet and Tatum Confrey will alternate the role of Susan.